Also see how Todd Bates answered his 20 Questions from Haunted America Tours Please Visit Here Now! • At some time in this field of study everyone is going to be either doing the interview, be a part of the team doing the interviewing, or be in the presence of the client of the location being investigated. Everyone needs to be as professional as possible while in the presence of the client as this not only says a lot about you but also reflects back on your group. Many people feel that how one acts is how you all will, be even though this may not be the case. • The client has contacted you with a specific problem or something that has affected their family and their personal lives. Usually the client has dealt with the situation for quite a while and has finally decided that the events that have been transpiring can’t be explained away with the every day typical reasons. Many times the client is almost to the point of thinking that all the ones involved with the incidences are losing their minds or are a little crazy. The interviewer needs to be reassuring, but also keep an open mind so that their views aren’t tainted without the proper evidence to support the client’s complaints. • A good tip (or habit that should be practiced) for interviewing is to request to run a tape during the initial visit with the client and throughout the interview. Many times EVP’s are captured through the conversations with the client and while asking the questions about the activities they are experiencing. While interviewing, observe everything around you and take note of things that you might need to check further into during the investigation. After the interview, be sure to make notes of anything you felt and/or observed so that it can be thoroughly examined with the investigation team. 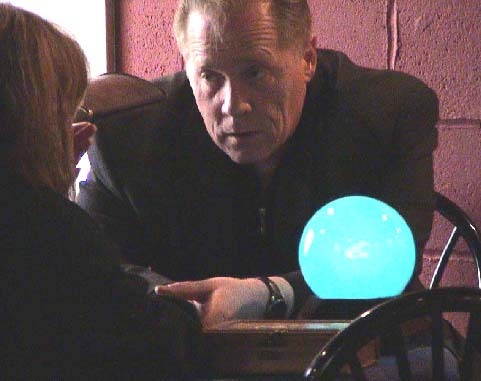 • During the interview and the actual investigation always remember the client called you about their problems not any of the paranormal experiences the team has experienced in their own lives. The only time that personal experiences should be brought up is only if the client explicitly asks about any similar activity or if the client needs assurance they aren’t the only one that has had things like this happen to them. If this is required, briefly tell them of past happenings for an example. Always remember: we are there to listen to them, not for them to listen to our past experiences and life events. HPI's Shannon McCabe investigating a haunting in Southern CA. • If your team has personal conflicts within the group, be a good team leader, nip it in the bud before you start your investigation. The negative energy from the problem will affect not only your other team member’s attitude, it will effect the evidence of the investigation and if you are not careful (depending on the entities of the location) you could be opening your team and client up to danger. Negative energy has a tendency to bring forth negative paranormal results. A good team leader will either get the problem resolved prior to the investigation or will select a team that doesn’t include the people with the problems. Negativity has no place in a professional paranormal team and it doesn’t provide a professional appearance for the client that you are working with/for. • While on location everything that is going on in your personal life should be left outside. Keep your attitude light so you are open to experience whatever occurs at the site. You are there to investigate the location for anything out of the ordinary but also to be objective to what might be causing it. This includes activity that is caused by non paranormal means. • Don’t reveal anything to the client until the team can review, discuss, and determine the evidence that every team member collected. The team needs to realize and accept that while on an investigation; yes, they took the photo; yes they took the video; yes they did the tapings for the EVP’s, but the evidence belongs to the group and to the people involved with the investigation, not to individuals involved in the investigation. All evidence is supposed to be kept confidential within the group that did the actual investigation and the people the paranormal activity is affecting. Even though you might have gotten the most fantastic video, photo, EVP, visited the most haunted location, etc. always remember that without proper information release you could be laying yourself open for a lawsuit. The people involved graciously allowed the team into their lives to experience and research the unusual happenings they have endured. By doing so they are showing that they are trusting the team to keep all the information and evidence confidential within the team that was on site. No one on the team should rush home and start telling and showing their evidence to everyone they come in contact with afterwards. If they have a problem with their equipment to secure the evidence for the team then they should contact a fellow team member to get help, not an outside source that will have privilege to confidential information. If a team member has personal problems from data and evidence they have collected they should never destroy it prior to turning the evidence over to the team leader! All evidence should be turned in to the team leader within a few days so that all the evidence can be reviewed, confirmed, then complied to submit to the client and the people the paranormal activity is affecting. When this isn’t done the information collected is not only incomplete, but also shows the team leader which ones on his or her team that he can depend on for future investigations to perform in a timely professional manner needed in all investigations that they are requested to do. • People should realize that many that don’t believe or accept what we do scrutinize our field of study harshly. We need not have our own personal performances make us look unprofessional on top of that. We have to always be honest with everyone on our team as well as the public because if we aren’t able to always be honest then how can the evidence we collect be accepted as legitimate and factual? • There is no room in this field of study for drama. Our field of research is well known for how intense it can be at an active location. The professional team members will get enough of a “rush” from the evidence collected from an active location without causing undercurrent “drama” within the members of the team. If a team member can’t be honest, can’t abide by the regulations required to be a professional team member, can’t keep information confidential, then to keep the team a professional group and to insure that the integrity stays intact, the team member creating the problems should be confronted and cut from the team. Though it is great when all team members can become friends, but just like any job, sometimes this isn’t possible. Conflicts of personalities, beliefs, unable to follow professional guide lines, some that make it a practice to use others for their own gain, those that back stab other team members to produce drama and excitement in their lives, that make agreements that once have gained access to a location or information then they don’t adhere to their agreements, those that set up other team members with false statements and foremost those that only say “I” instead of “WE” or “TEAM” have no place on an elite professional paranormal team. If other team members can’t accept the decision for the good of the team then they have the right to resign from the team because all teams have to accept what creates a good elite, professional, credible, and honest team that is able to work towards professionally collecting the most credible, scientific and never before obtained evidence to offer to society to confirm what we are researching. If we can do this, then our team will be one that is sought out by the public to investigate on a continual basis. All content is © Copyright 2005 by Haunted Voices and its respected authors. If any of you would like more information or have questions please feel free to contact me via email. Copyright © by Haunted Voices All Right Reserved.